Look at this green field. It’s so beautifully green. Not one but there are three shades of green. One dark, other a bit light and one between them. It just perfectly compliments the surroundings, the white building in the background, the green tree in the foreground and the yellow and black fencing running below it. This is what I gazed upon as the skies cleared and the sun appeared after two days. And the sun shone bright and strong and radiated it’s heat to all the surroundings, drying some of the structures and the ground in the process. And I am surrounded by green fields like this. My rig where I work is right between all these greenery. And today I saw farmers coming here and tending to their fields, hiring people to get their job done late till the evening. The rain did come in heavy showers from time to time but they could be seen working away. This perfectly sums up the saying: the grass is always green on the other side. When I look into my side, I see no grass at all. Metal everywhere. In grey and black and red and yellow and orange. Rust could be found everywhere and anywhere. 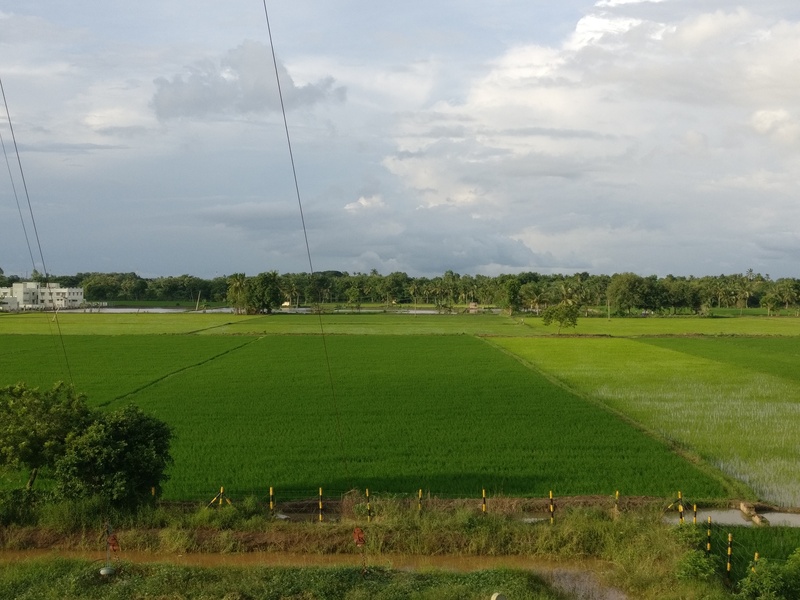 And while I was working amidst this my gaze sometimes falls upon these marvellous fields and I wish how my life to be green like this. How I have always wished to move on to greener pastures, contemplating and researching about them and sometimes even putting myself in those shoes. At that point, at that momentary point, I find myself in that green field. And its all green and bright and happy and beautiful around me. And when I look into the distance I see a rig. An oil rig. And I inquire about it, the work there, the people and the life there. On hearing it, I suddenly find these green fields I am in wilting away. They are turning brown and broken and sad. And the rig, its blooming up. Green grass is sprouting abundantly in its vicinity. The grass has taken over the rig structure and now I can see a vertical garden budding its way through the rig, hiding away all the metal and painting them in vibrant shades of green. In awe I close my eyes. When I open them I find myself sitting amidst the metal, in my rig. No creepers have climbed the structure, no darth of red and orange and black and grey. And then I walk up to the job in hand. This is indeed life. Do not get saddened by the thought, in fact realize, this will remain the truth of life. Do not find a way to escape it either, but just know to accept.